Help small entrepreneurs revive the Niniveh Plains! ACTION – Fraternity in Iraq launches a support program for craftsmen and entrepreneurs who want to restart their activities in Qaraqosh. Help them bring life back to the Niniveh Plains! The city of Qaraqosh was liberated in October 2016 but its inhabitants found it in a dreadful state : the 7,000 houses were plundered or burnt down, infrastructure is damaged and businesses were ransacked. Therefore, there is work to be done so that those who so wish can return home. In conjunction with Qaraqosh city’s reconstruction committee, Fraternity in Iraq has decided to give special support to the entrepreneurs and craftsmen who wish to relaunch their businesses in the Niniveh Plains rapidly. “We are confident that those pioneers will be able to allow the economic recovery of the city and the return of the inhabitants”, explains Aude Laplane, in charge of the project for Fraternity in Iraq. For several weeks, she has been working alongside the first entrepreneurs who want to embark on the adventure. Two brothers, Sami and Salam, are leading one of the most ambitious projects. They used to own a poultry farm of 40,000 chickens that employed 6 people. Thanks to Fraternity in Iraq’s program, they would like to start over with 10,000 chickens. They will restore the buildings themselves, trying to reuse the little equipment left by ISIS, but they need seed money to buy the first chicks, food, and the missing equipment. The two brothers, Sami and Salam, all set to relaunch their poultry farm ! 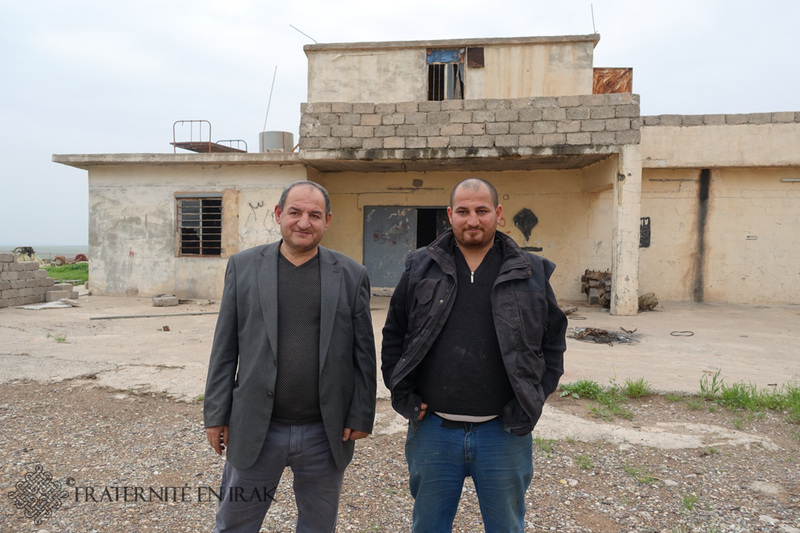 Just like those two entrepreneurs, some craftsmen already wish to get back to work in Qaraqosh. 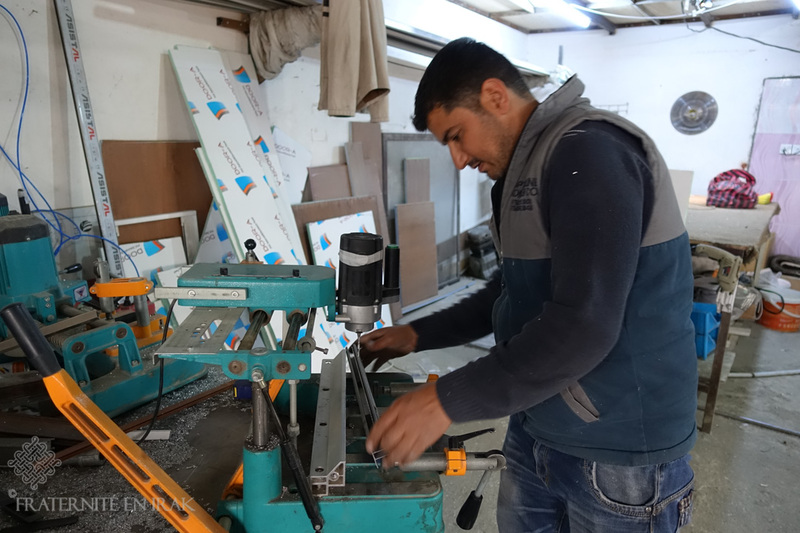 Among them, Zihad and Deaa, specialising in PVC joineries, one of the key trades for the reconstruction of the town. The first one used to work with his brother and two other employees before the arrival of ISIS, while Deaa was his own boss and employed six people. Both of them found their premises in good condition but their equipment had been stolen: they need help to re-purchase it. Rudi Salam, a joiner also, wishes to concentrate on steel and aluminum. He contemplates returning to Qaraqosh without his family at first since the second floor of his house has been burnt down. The three of these thirty-year-olds are married with children, and are determined to restart their activities, at the service of the city’s reconstruction. Rudi in his Qaraqosh workshop. He still lacks many tools to restart. Some young single people also want to get back to work : Halla, a baker, used to employ four people before ISIS came to Qaraqosh. Located on the edge of town, his shop is in good condition, luckily. The purchase of the oven and mixer would him to restart rapidly. Two hairdressers are convinced the workers will need a trim or a shave from time to time! Lastly, Rocan, a printer in exile in Erbil, wants to return to Qaraqosh to ply his trade which is essential for those who take steps with the Mossul court, transferred to Qaraqosh. 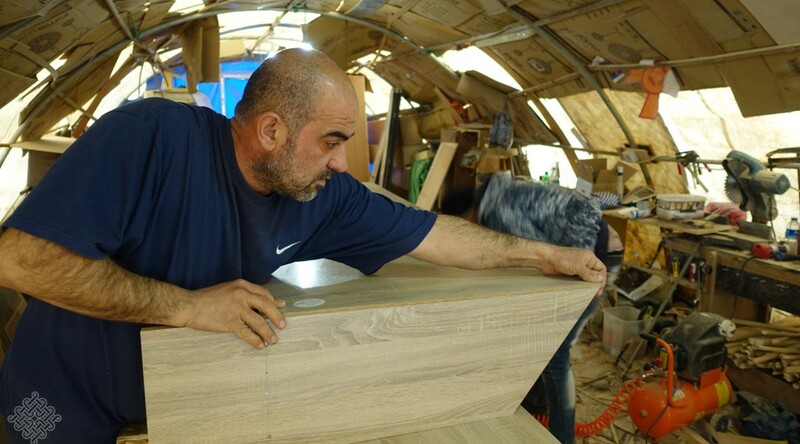 Qaraqosh city’s reconstruction committee refers the entrepreneurs and craftsmen who need help restarting their businesses to Fraternity in Iraq. The association then makes sure that the project is sound and verifies the motivation of the project initiator. Aude, our project manager, visits what is left of the said business, checks equipment and supplies prices and discusses the funding needs with the entrepreneur. Once the project is set up, Fraternity in Iraq determines with the entrepreneur the financing mode that is most relevant to his situation: loan and/or donation. Fraternity in Iraq has already initiated the funding of the very first projects. But we need you to contribute to a fund that will allow for a wider program. We estimate that the funding required to help with the projects we have already thoroughly reviewed amounts to €200,000. Those projects are vital to revive the Niniveh Plains. They are concrete, and led by the Iraqis themselves. Farmers, joiners, printers, bakers or barbers : they are relying on us, let us get mobilised!